There are two completely NEW SERIES in the latest issue of Game Fisher’s Diary – the FREE TO VIEW video magazine for fly anglers everywhere. In ‘Bassassins’, two American anglers hit the road to indulge in their one true passion, fishing for freshwater bass, and use their Go Pro cameras to capture the excitement of targeting big fish on fly and on lures. Also in the issue we have Part One of ‘Fly High’, a beautifully shot set-to-music video diary of a day’s running water fly fishing, starting on the beautiful Broadlands beat of the River Test with river keeper John Hall. There’s also the only video fly fishing news bulletin, including pictures of a new world record brown trout, plus news on how you can claim a special offer of a Hardy Marksman WF7 fly line for less than a third of the normal price. 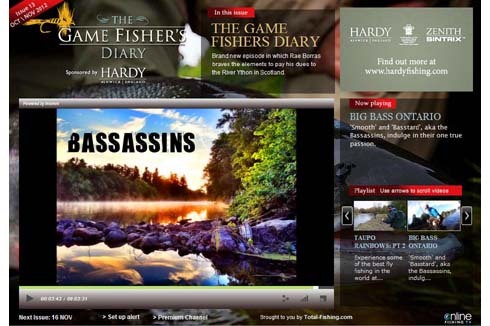 These new series and much more are FREE TO VIEW in Issue 13 of ‘Game Fisher’s Diary’.